Take your phone on the go with the Nike Lightweight Armband 2.0. Made to store most smartphones, this lightweight armband is perfect for running, cycling, walking and whatever else you're into. A clear window protects your screen, yet still allows touchscreen access, while a stretch strap ensures a great fit. Earphone holes at the top and bottom ensure you can listen to your tunes no matter what, while a cord management loop at the side keeps pesky wires out of your way. 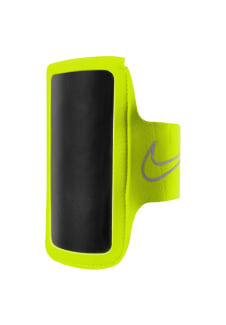 Reflective details round out this performance armband.